Uniform, Equipment and Tack requirements for the unit. 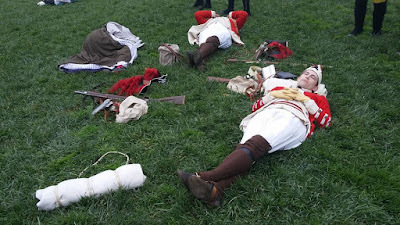 The 17th attended the battle of Germantown in Philadelphia PA Oct 1st. Despite the weather it was a good turnout. 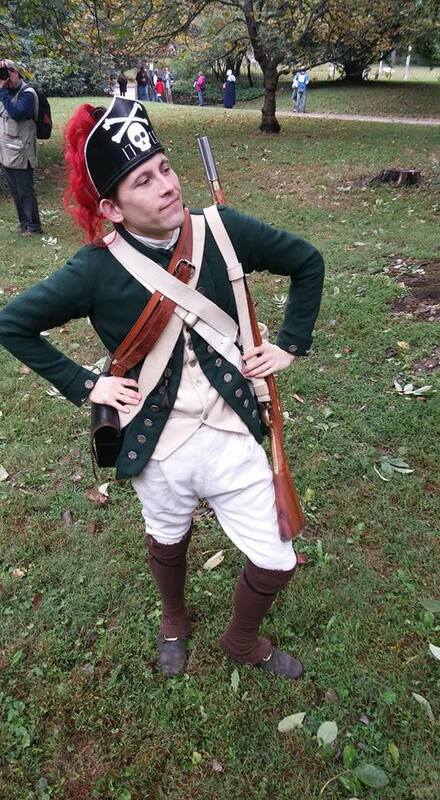 We took pictures of Sgt Clive wearing the short green coat that appears in the Della Gatta painting of the battle of Germantown. This will be part of our uniform that we will wear at Philadelphia campaign events. 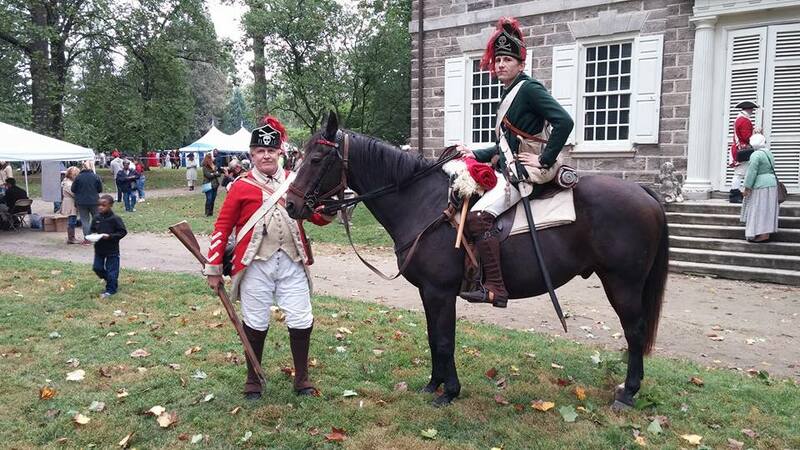 Members of the dismounted detachment of the 17th Light Dragoons attended the British Brigade/Continental Line sponsored event at Mt Vernon earlier this month. 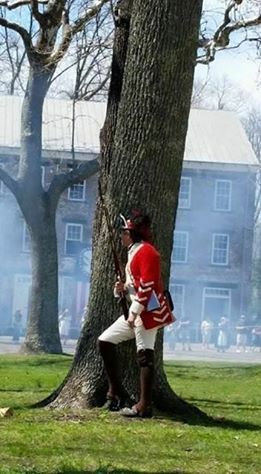 It was a very well attended event both by reenactors and visitors to one of the most iconic historical sites in North America. Both Mounted and dismounted troops are preparing for the next event at Monmouth Courthouse, N.J. in June. 235 years ago, General Cornwallis led his hungry, tired and poorly supplied troops to Guilford Courthouse in present day Greensboro North Carolina. 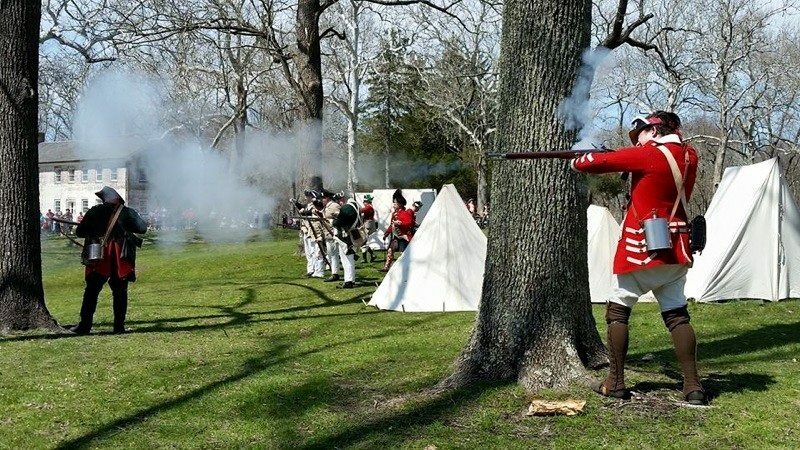 Unable to be resupplied and strengthened by fresh troops, every British Soldier lost meant 1 less man in Cornwallis' Army. 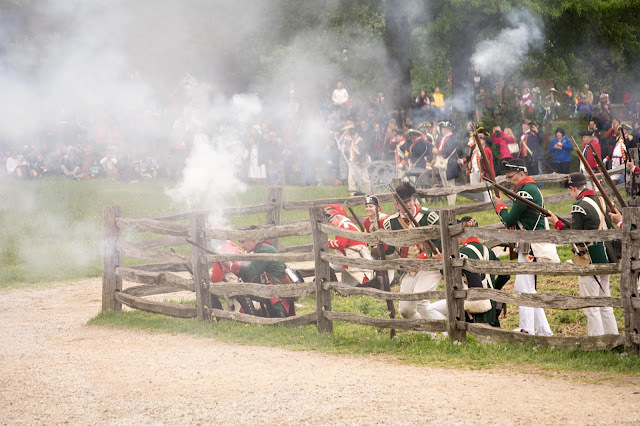 At Guilford Courthouse, a short but very vicious battle pitted desperate forces on both sides, with the Crown Forces outnumbered by more than 2 to 1. 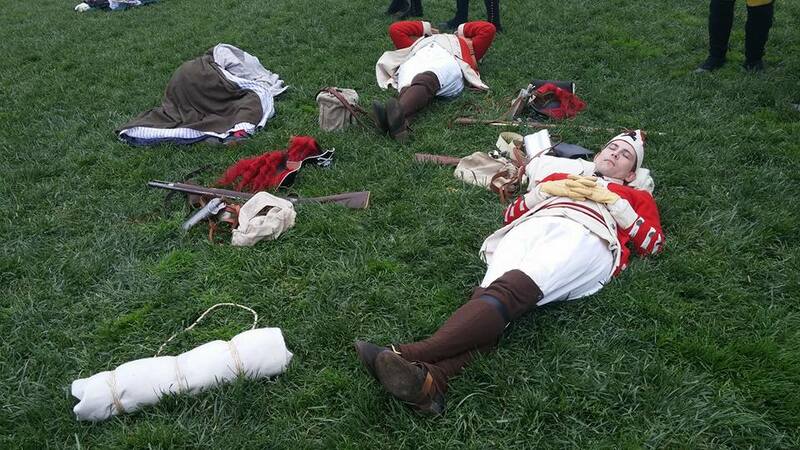 At the end of some bloody hand to hand fighting, the British Forces won the battle and held the ground, but suffered horrendous and crippling losses of more than 27% of their forces. This marked the end for Cornwallis and his depleted Army, his only hope was to head to Yorktown, Virginia, for rescue by the Royal Navy. Unfortunately for them the French Navy got there first. 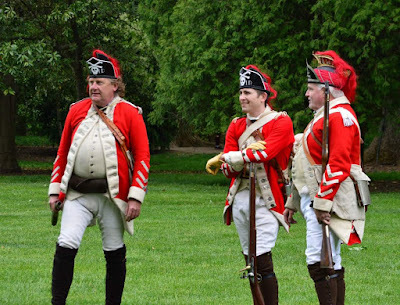 With Cornwallis, attached to Tarleton's British legion was a detachment of approx. 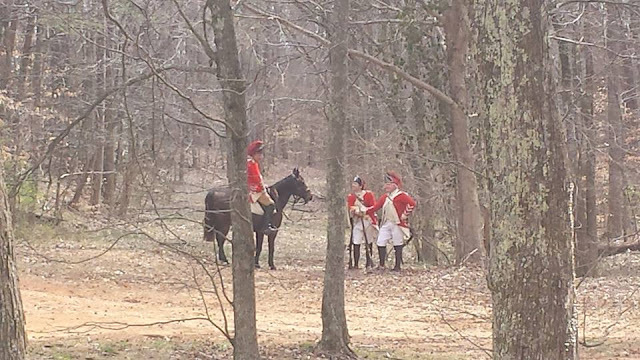 50 17th Light Dragoons. 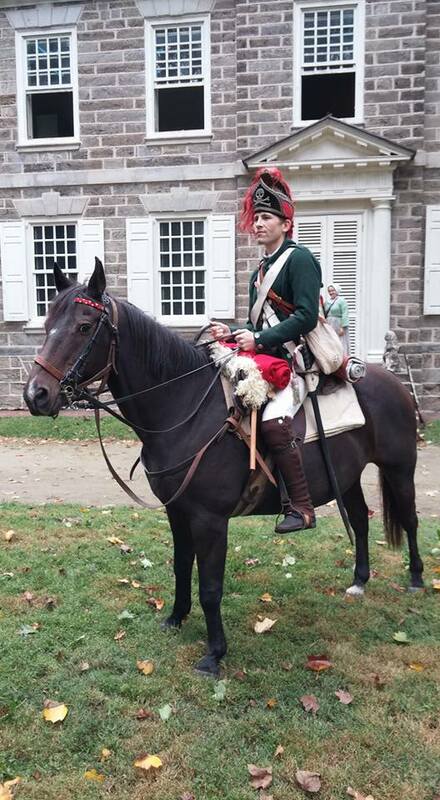 The only regular cavalry attached to the Army, the men of the 17th were still proud of who they were and the regiment they represented. 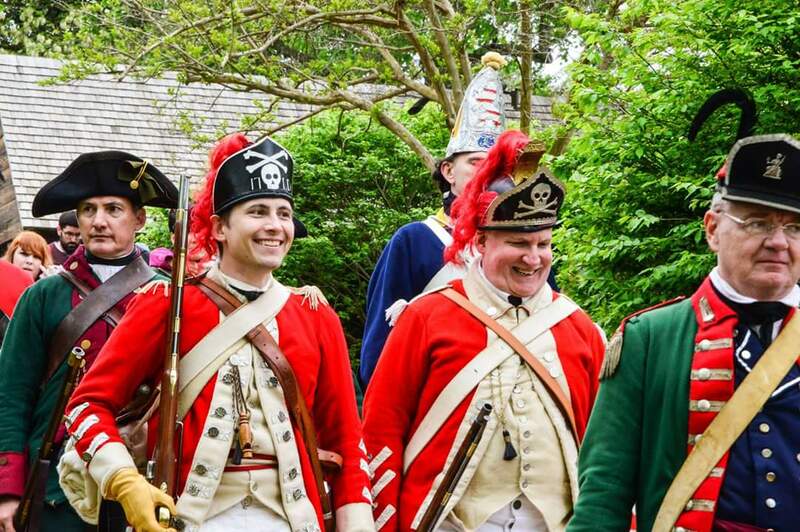 They refused to be recognized as Loyalist troops of the British legion by wearing the green coats of the Legion. Instead the 17th patched their ragged red coats and continued to wear the distinctive uniform and headgear unique to the regiment. 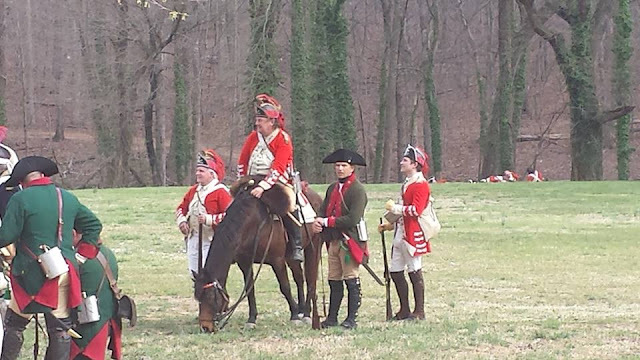 At the 235th Anniversary of the battle this year, members of todays recreated 17th Light Dragoons were present to reenact the battle. The anniversary this year also marked the unveiling and dedication of the Crown Forces Monument at Guilford Courthouse National Battlefield Park. 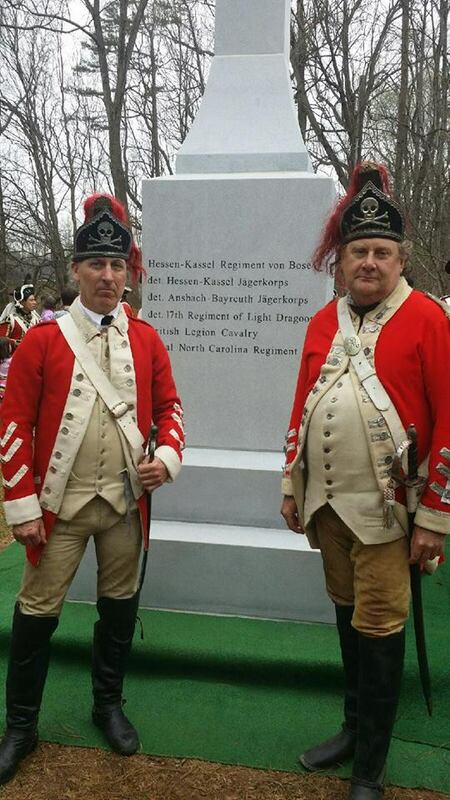 We were proud to be at the ceremony to represent the members of the regiment who fought and died at the battle. All the regiments of the British Army present at the battle, including German and Loyalist units are engraved on the monument to be remembered for their dedication, and bravery. We are working on updating and improving our website. Recently added are contemporary paintings and drawings of British Light Dragoons. We are also adding photos of period weapons and equipment. Although we try to research and be as accurate as possible in our posts and captions, we may let something slip by, so we would be happy to hear from you with input. 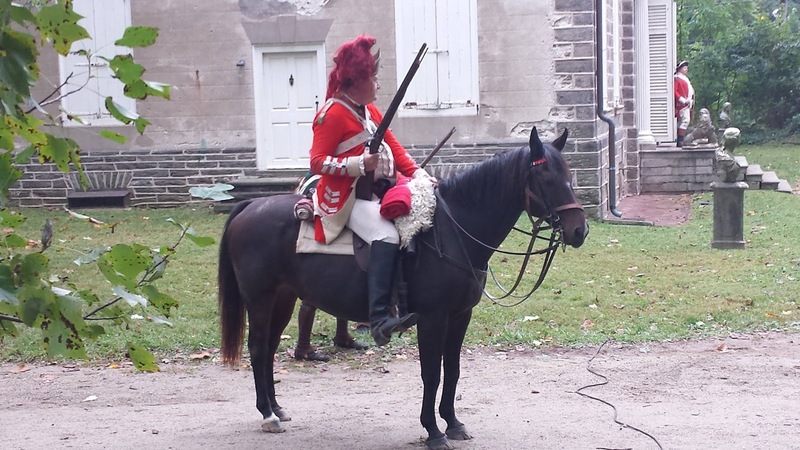 In the meantime, our members are working on preparing their kit for the upcoming season, and we have some new impressions that we would like to field this year, including a mounted and dismounted trumpeter. We are always looking to fill the ranks, so whether dismounted or mounted, take a look and see if you are interested in us. 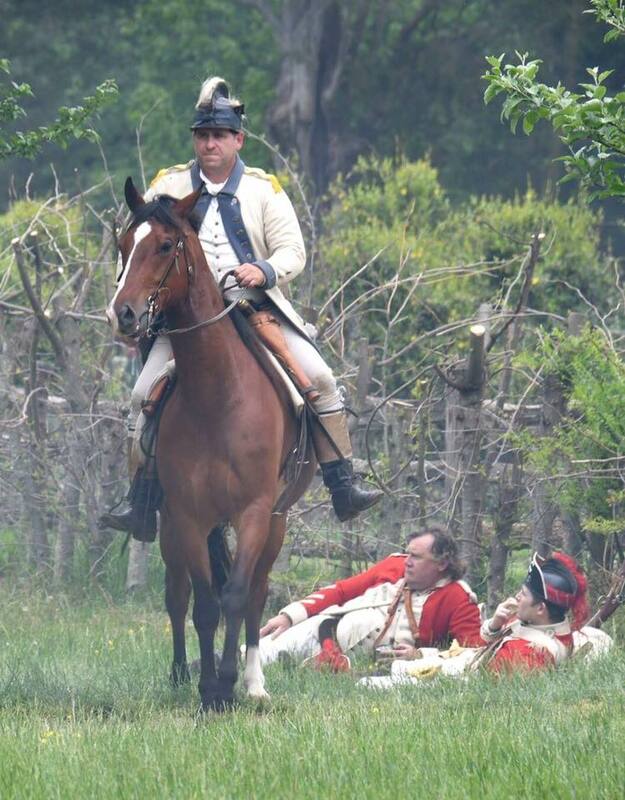 We are always looking for potential new recruits for both the mounted and dismounted sections. 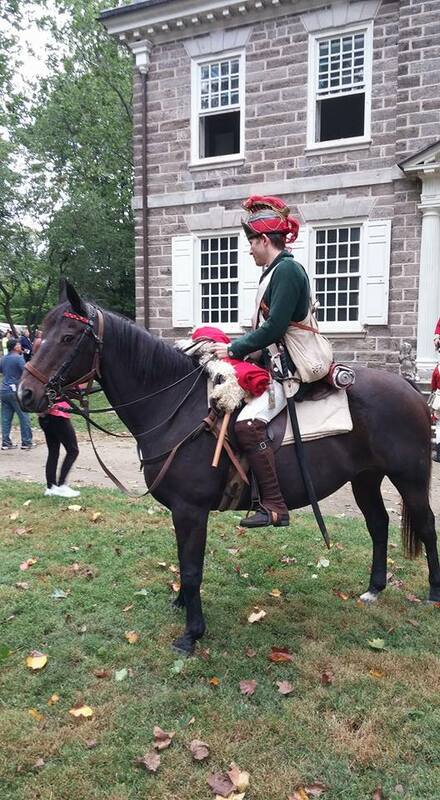 Mounted recruits should have their own horse, or have access to one that they can use. The rider should be competent and confident enough to walk, trot, canter and gallop in a controlled situation amongst other horses. The horse should be likewise, and also be ok among other horses, both on the battlefield and on the piquet line in camp. If you are working with a horse, we can still accommodate you but may have some restrictions early on to ensure the safety of the rider, the horse, other members of our unit, and other units. 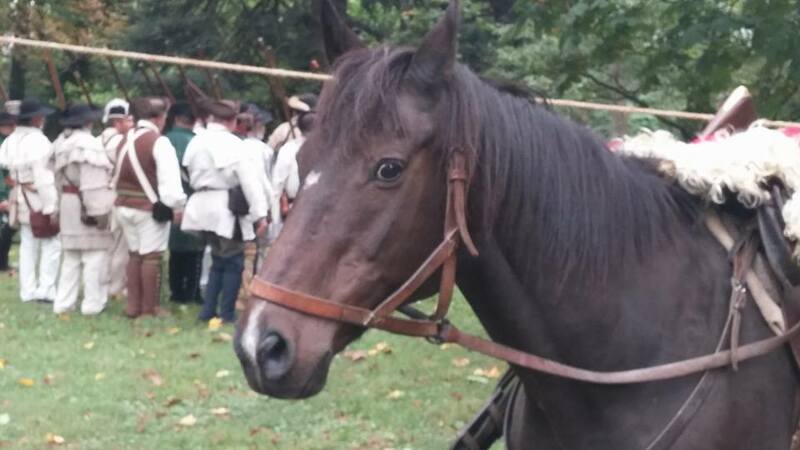 We are happy to work with you and we understand the time and effort involved in working with a horse new to reenacting. A few of our members are professional horsemen from various disciplines, so we are a great source to help you with safely integrating you and your horse on the field. You must be 16years of age or older to ride a horse on the battlefield, and to use weapons at events. If you are training your horse to work with gunfire, we can offer suggestions on how to go about it. The key to any good training is patience and consistency. Horses can be of any breed, but must be of solid colour to historically portray the animals used during the American Revolution. (no obvious paints, appaloosas or palominos please). You will need to be able to neck rein your horse and use a Pelham style bit on him/her. Stallions are not permitted for safety reasons. We will integrate new riders and horses into events depending on ability and safety. We can help you aquire tack, kit and weapons and may have some loaner equipment available until you re fully kitted out..
We also have members who can ride, but don't not have a mount currently. 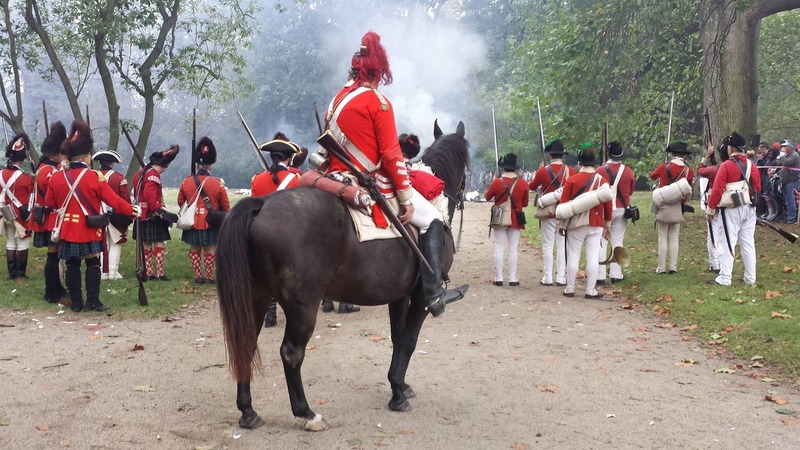 We would still happy to have you, if that is the case, and you can work on getting your kit together and field with our dismounted unit until you have found a new horse. 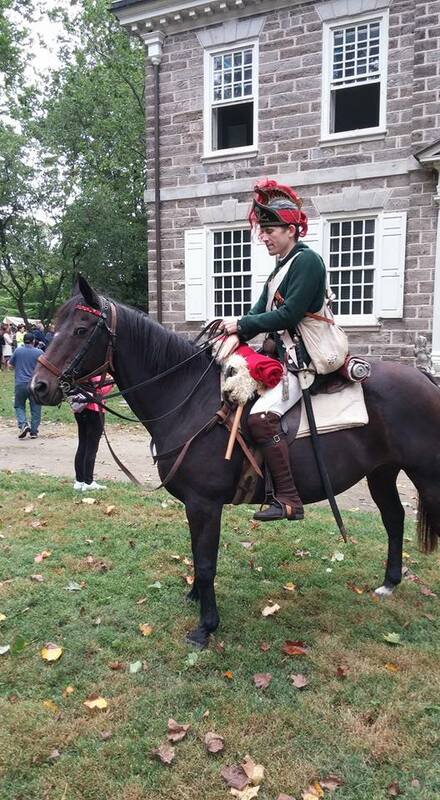 Historically, the 17th LD were augmented with dismounted dragoons before they left Ireland to come to America. 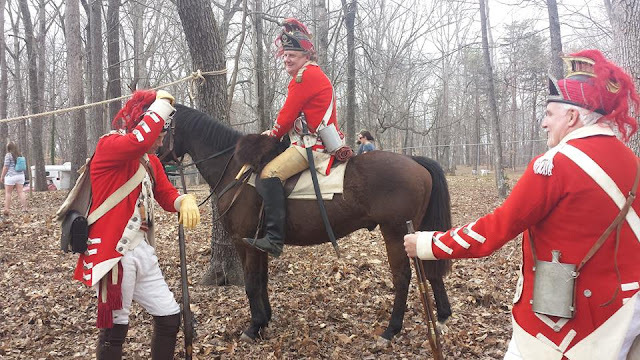 We have an accurately kitted out troop of dismounted dragoons, that at events, generally act as detached light infantry troops who work closely with our Horse. 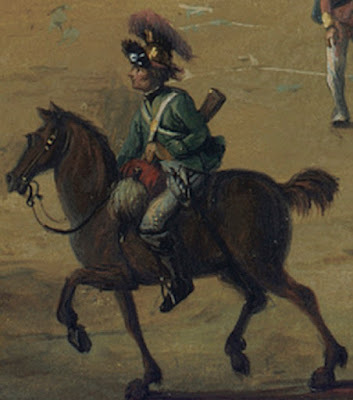 Although similar, the kit of the dismounts is less cumbersome and more adequate for working on foot. Members of the dismounts work on British Army weapons drill and light infantry tactics, and are generally in the forefront of the battlefield and in the thick of the action. Once again you must be over 16 years of age to handle a weapon on the field. You should be prepared to be able to walk and occasionally run short distances over various types of terrain. We do have some equipment and weapons that we can loan out while new members are acquiring their kit. 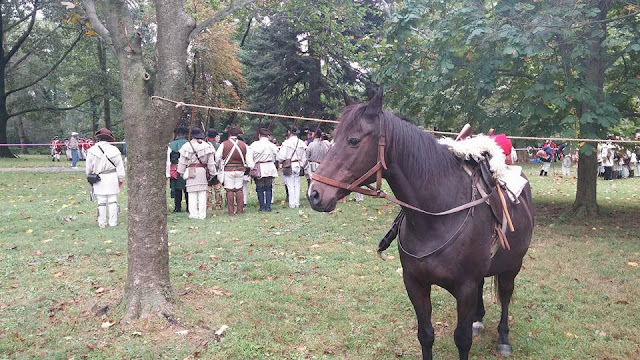 Both units camp together, and we generally have a campaign style camp that includes the horses, and we all chip in to take care of camp, food, and the horses. and Success to British Arms! It's been a fairly quiet year event wise for the 17th, but we are preparing to head to Fort Ticonderoga, NY Sept 12th & 13th. It's an awesome spot, so can't wait to see it. We are excited to have some new recruits joining us, including a trumpeter for our dismounted unit. We are also looking forward to meeting some more potential recruits during the weekend. 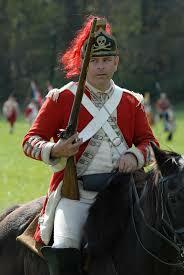 We are always looking for new members both mounted and dismounted, so contact us if you have any interest. 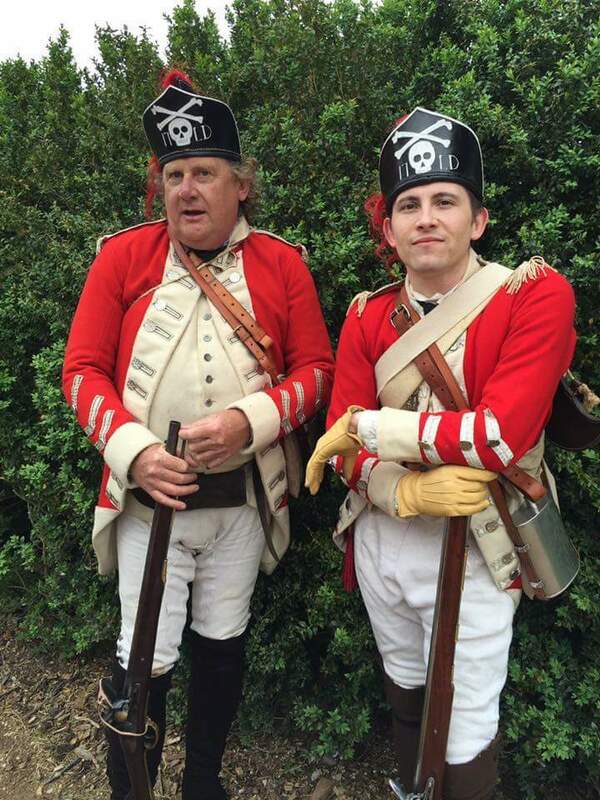 Members have been working on getting their kit sorted out and ready for battle. 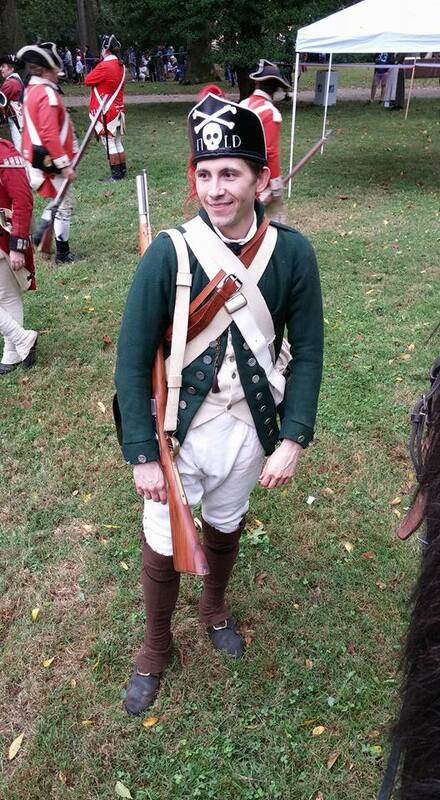 Our dismounted unit headed by the indomitable Sgt Clive will be sporting their new helmets, and blazing the trail! 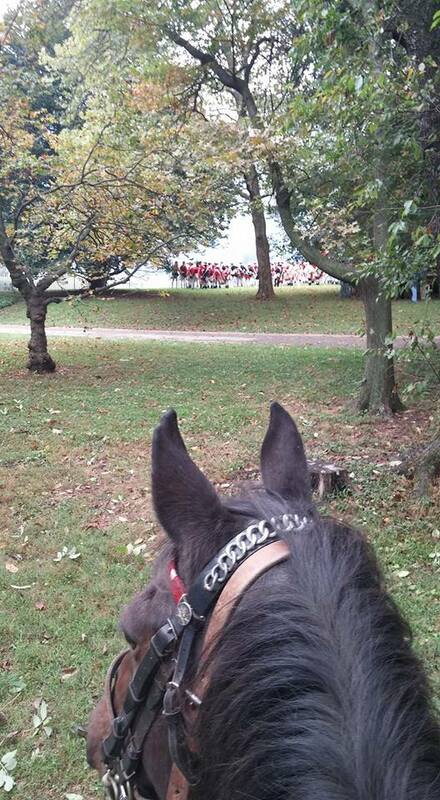 If you are going to be there stop by and say hi to us and the horses! 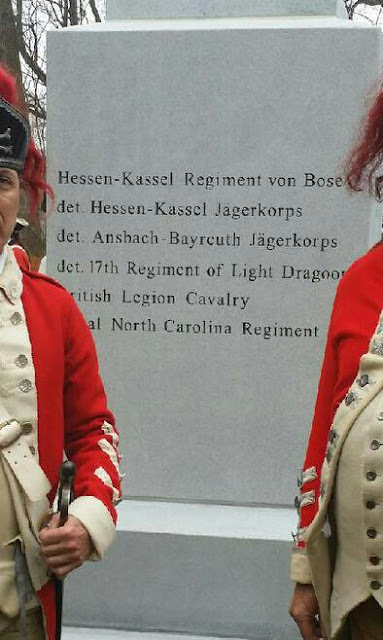 Welcome 17th Light Dragoons website! We are a British Cavalry reenactment unit that portrays 1 of only 2 regular British Army Light Dragoon regiments that served in America during the Revolution. 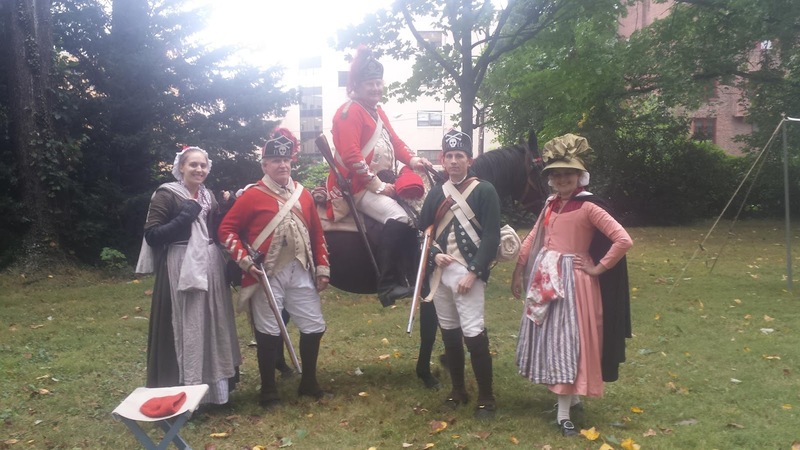 The 17th arrived in America just weeks before the battle of Bunker Hill, and were some of the last troops to leave America in 1783. 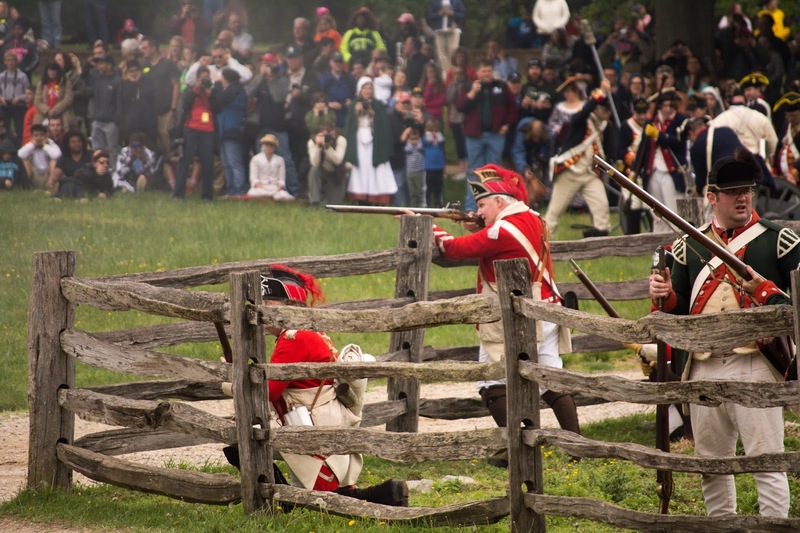 The regiment served in all areas of conflict during the war including Boston, New York and Philadelphia, and served with distinction with Colonel Tarleton and the British Legion during the Southern Campaign. 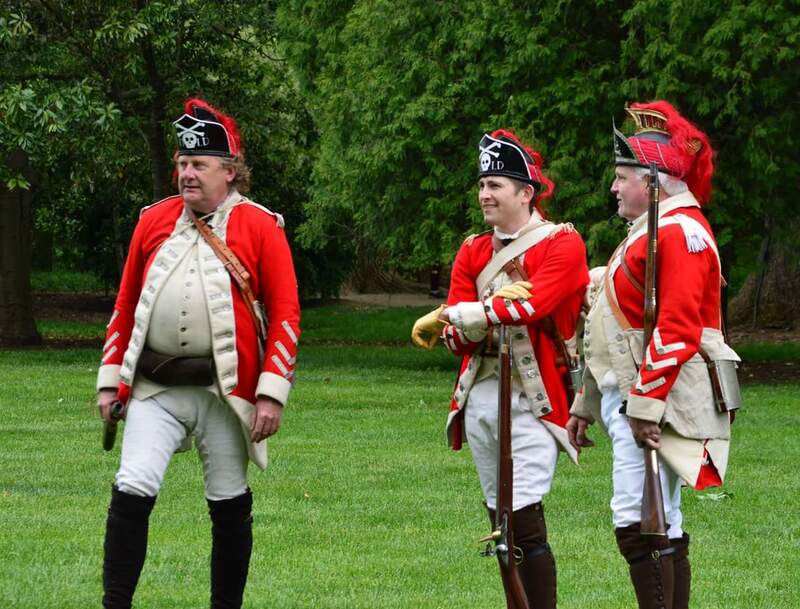 We are proud to represent a regiment with a long history that has spanned centuries, and is still an active serving tank regiment almagamated with it's sister regiments as the Queens Royal Lancers. They still carry the skull and crossbones and Motto Or Glory on their cap badges. A badge that was designed by the founder of the regiment colonel Hale after the death of his friend General Wolfe at the Battle of Quebec in 1759 and in honour of the General. 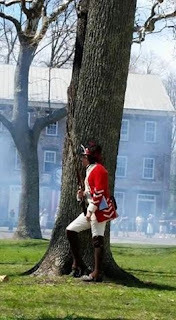 Our unit members are based in Virginia, Maryland, Pennsylvania, New Jersey, New York , Tennessee, and Maine; We travel to various 18th Century Living History events and Reenactments up and down the East Coast. Take a few moments to peruse the site. 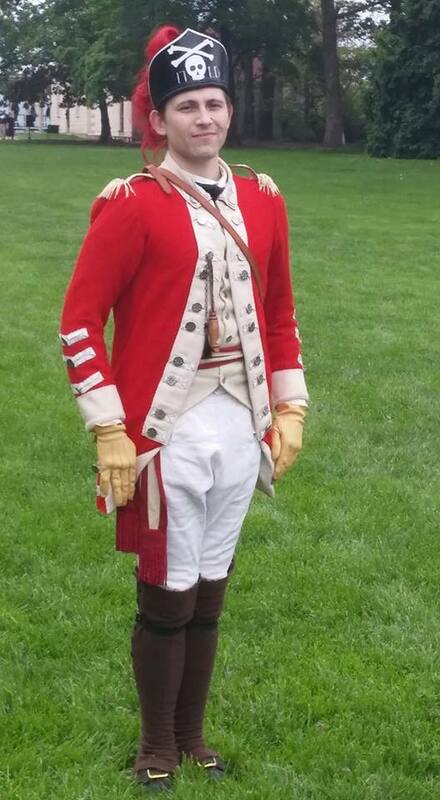 If you think you have what it takes to serve as one of His Royal Majesty's Dragoons, and are interested in accepting the King's Shilling, go to the Recruiting area for more details! Although this is the proposed schedule, other events may be added during the year if interest is shown. 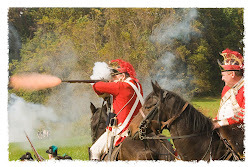 Copyright 17th Light Dragoons 2010-2012. Powered by Blogger.